Located in southwestern New Hampshire, our vines grow in clay and gravel laid down by Lake Hitchcock that existed over ten thousand years ago. 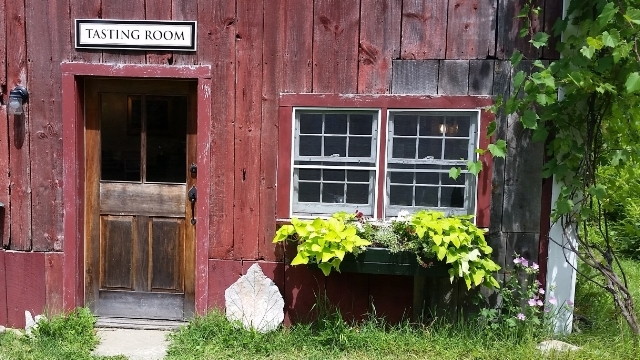 The farm was built in the early 1800's, an antique barn houses the winery. We have chosen varietals that grow with vigor in these ancient soils: Frontenac, Seyval, LaCrosse, St. Croix, Frontenac Gris, Marquette, Foch, Noiret, and La Crescent. The distinct character of each is preserved through careful hand harvesting and attentive fermentation. Learn more About Us. Join our new Wine Club. Have wine shipped directly to you! See photos of our winery in the Photo Gallery. 2016 Frontenac's deep garnet color complements its distinctive cherry aroma and inviting palate of blackberry, black currant, and plum. This wine is has a full body and wonderful spiciness from the American oak it has been aged with. Frontenac pairs well with hearty foods such as beef, lamb, pasta dishes, and barbecue. The 2014 vintage is also available in limited qualities. 2016 St. Croix is a light-bodied, deep-red dry wine with soft tannins and aromas of blackberry, currant, violet, and spice. It is perfect with light meals, pasta, pizza, chicken, or salmon. St. Croix is also great with appetizers and soft cheeses. Several vintages of St. Croix is available. 2015 Marechal Foch produces a medium bodied wine with a pleasant ruby color. This French varietal grape was originally grown in the Alsace region and is reminiscent of the Burgandian style wines with dark berry characteristics. Other vintages are available. 2015 Marquette is a medium bodied red wine with an attractive deep red color. It has aromas of cherry, black current and berries with a finish of spice and black pepper. This wine pairs well with pasta dishes in addition to chicken and lamb. The 2014 and 2015 vintages are aged with French oak, while the 2013 vintage is un-oaked with only a few bottles left. 2016 Marquette Rosé is an off-dry Rosé from our Marquette vines which exhibits a wonderful red berry aroma, a complex palate, and long finish. A great summertime wine to be enjoyed with light meals or completely on its own. 2015 Wolf Pine Red is a blend of Frontenac and Noiret and is an excellent full-bodied wine. Noiret, with its fine tannin structure, distinct black pepper character, and notes of raspberry and blackberry, fully complements the classic black cherry flavors of Frontenac. This wine sells out quickly and there are only a few bottles of the 2014 vintage available. 2016 Happy Camper is an off-dry white wine of Seyval Blanc and LaCrosse with subtle aromas of citrus and pear. This is a fun wine whether you have just hiked a trail with a view or are sitting around a campfire with good friends. 2015 is the first vintage of this wine and we are sure it will be a big hit. 2016 La Crescent has an intense aromatic nose of apricot, peach and citrus resembling Moscato. We produce La Crescent as a dry white wine. It is fruity and crisp while not being overwhelming. Serve chilled as an aperitif or with local cheeses. 2014 LaCrosse is a full-bodied white wine with the aromas of pear and apricot and a slightly muscat finish. LaCrosse pairs well with seasoned chicken and seafood. 2016 Frontenac Gris is a wonderful amber-colored wine, presents enticing aromas of citrus and tropical fruit. Its brilliant balance of fruit and acidity creates a lively, refreshing wine. It pairs well with Asian cuisine, lobster and other shellfish, as well as spicy food. Closed for the season. See you in June! All Poocham Hill Winery wines are made from our own grapes. And what grapes do we grow? You might expect to hear something familiar like Chardonnay or Cabernet, but we'd like to introduce you to the cold hearty varietals we grow. Our goal from the start has been to make the best wine from the best grapes that will grow in our microclimate. When you taste our wine, you might find similarities with familiar varieties you enjoy, but each of our wines is unique. We invite you to come and taste them. Each is an experience into itself. Very friendly staff and beautiful location.